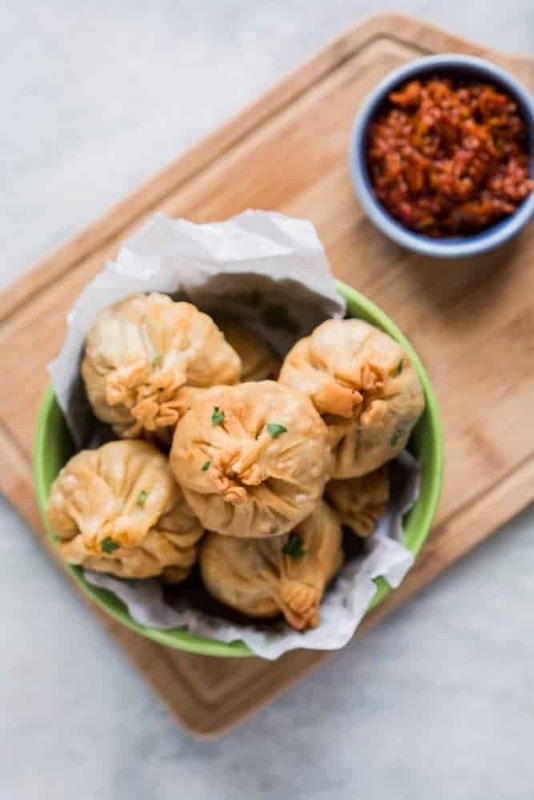 When KitchenAid India approached me for a recipe that was my favorite from my mum’s collection, the first thing that came to mind were these Chinese Potli Samosa Wontons! I remember requesting these every time we had Chinese fare at home because there was some strange joy in having these potli (shape of a pouch) shaped fried wontons. They also remind me so so much of the Chinese samosas that we get at Raipur, which is why the name. I’m not particularly sure how mum would feel about me calling these chinese wontons samosas, but the wonton wrappers are inspired by samosas and well, like every Indo Chinese dish Chinese samosas are an amazing invention! Sorry mom, you’ll just have to deal with this. She would serve them in a garlic sauce that was spicy, soupy and so irresistible. The trick was to add them to bubbling sauce just before serving so that the fried wonton covering was still crisp, but just soaking with sauce. It’s a fine balance that mum was treading with this recipe, but it always worked. 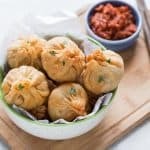 By the time we were served these, the covering would become softer but still hold it’s own and the sauce would permeate the insides to make the noodle filling even better. I don’t make these as often because we usually stay away from fried stuff, but when I recreated this recipe for KitchenAid the memories just came rushing back! These are really simple to make and can you imagine how they’d look when you serve them as snack alongside some schezwan sauce at your next party? Your guests are going to think you laboured over these for hours and hours, but in reality these only take 45 minutes from start to finish! I’m an absolutely fan of spring rolls and fried wontons whenever we order in Chinese but I’m always disappointed by how oily those things are. One bite and I usually just let them go. Since the coating is made at home, it’s slightly thicker, more samosa like, and not oily at all. My recipe includes a recipe for vegetarian lo mein noodle filling, but you can just as easily add chicken, pork or shrimp to it if you prefer non vegetarian wontons! This recipe is so so adaptable! Don’t forget to make the Schezwan Sauce if you are trying these out because that combination is absolutely 100% legit! 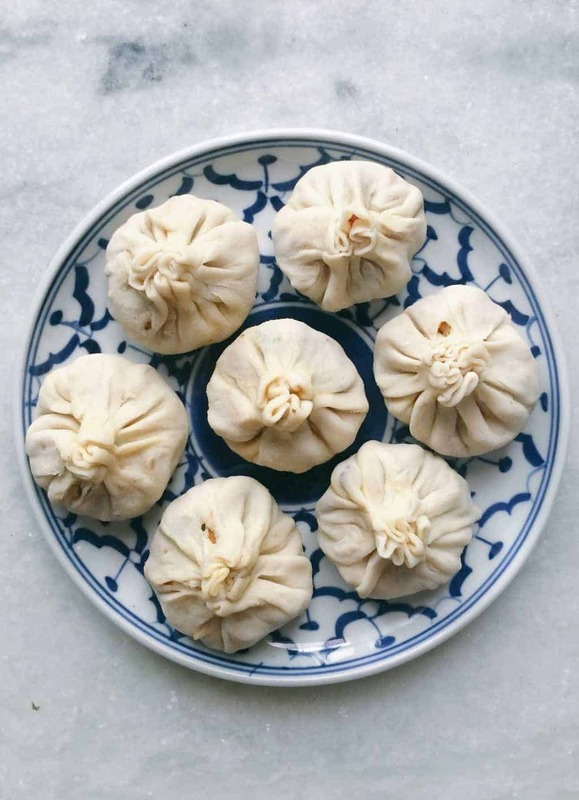 And if you are a chinese fan, don’t forget to follow my Asian Deliciousness board on Pinterest for some daily drool worthy recipes! Love samosas? 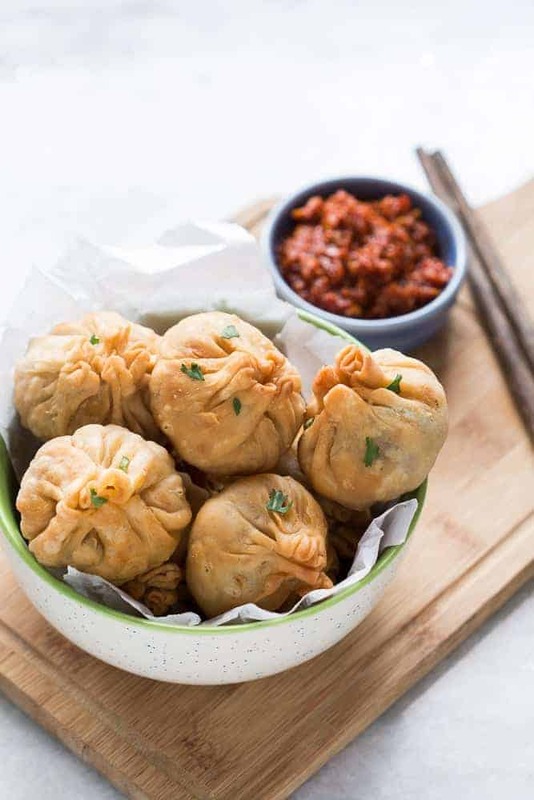 These indian chinese vegetarian chinese potli samosa wontons are going to blow you over! Also includes recipe for homemade samosa wrappers! Combine together flour, oil and salt and use your fingers to make a breadcrumb like crumble mixture. Start adding water little by little and knead together till you get a smooth but supple dough. Cover and let it rest for 15 minutes. While the dough is resting, make the noodle filling. Heat oil in a pan and saute garlic for a minute. On high flame add carrots and mushrooms and stir fry for 2 minutes. Add the capsicum and cook for another minute. Whisk together all the sauces and add to the pan, along with noodles and salt. Stir fry on high heat for another minute or two and switch off the flame. To make the wontons, divide the dough into 8 parts. Roll out each dough into a circle about 2 1/2 inches in diameter. Place a tablespoon or so of the filling in the center, and bring the edges together till they are shaped like a potli bag. Repeat till all the wontons are made. Heat oil in a large pan or kadhai, and fry the wontons on medium high heat till golden brown from outside, and cooked inside. If your pan is not large enough, fry the wonton in two batches. Serve hot with some schezwan dipping sauce. sounds great ! can we use readymade (store-bought) wanton wrappers for these as well ? possible to bake these, Richa ?? Yes, homemade wonton wrappers will work, but they may be hard to shape like potlis, so you can wrap them in the triangle shape of samosas instead. You can bake them but make sure to brush them with oil before baking.